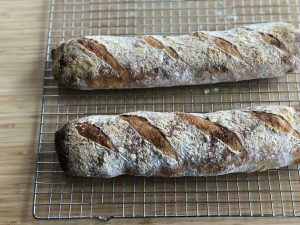 This no-knead baguette recipe doesn’t require a lot of hands on work, just some time. You can make the dough the day before, let it rest in the fridge overnight and bake it the next afternoon. You don’t need any special equipment, most of what I use is improvised; my blade for scoring the baguettes is a box opener blade, and to proof them I just dust a table runner with flour, fold it up and it works like a charm. *If you can’t find fresh yeast, you can use about 3/4 tsp of active dry yeast. Instead of mixing it with 1 1/2 tbsp cold water, you are going to mix it with warm water (113ºF) and a pinch of sugar, let it sit for 5 minutes then add it to your dough in step 2. Add the 340g cold water and 4 cups of flour to a large mixing bowl, mix with a large mixing spoon until well-combined, it will look like a large shaggy ball of dough. Cover with a plastic bag or clingfilm and let it rest for 1 hour at room temperature. After your dough has rested, in a small cup or bowl combine the 1 tbsp cold water with the fresh yeast, mix until dissolved and then add it to your dough. Mix with mixing spoon until completely combined (about 1 minute of mixing), then add in salt and mix that as well until completely combined, about a minute. Oil a large rectangular container - about 9 inches or so in size (this can be any kind of storage container, baking dish or pan) place the dough inside and roll it in the oil a bit to make handling easier, then hold it up in your hands and start tucking its edges underneath itself to form a ball and place it back in the container. Cover the container with a lid or clingfilm and chill in fridge for 15-18 hours (it will be ready at 15, but it can sit for a bit longer that that if you want to bake a bit later). First you will prepare your cloth for proofing the baguettes once we shape them. Place a clean linen cloth or table runner on a tray or wire rack. Dust generously with flour, set aside while you shape the bread. Generously dust your work surface with flour, then gently nudge your dough out of the container with a bench scraper (try to keep its rectangular shape as much as possible and try not to deflate it). Divide your dough into two even pieces. First you will pre-shape your dough: take each piece and fold it over itself lengthwise, gently pressing the seam down with the heel of your hand or if you prefer you can gently pinch the seams together with your fingers. Once you do this to both of your pieces of dough, leave them on your floured surface, lightly dust the tops with flour and cover them with a cloth or a plastic bag. Leave them to rest for about 30 minutes. Shape your loaves. Once your pre-shaped loaves have rested, take each loaf, flip it seam side up, repeat the gentle folding and pinching once more, then gently roll out to a 13 inch long loaf, this will only take a few movements, so be gentle and slow. Carefully transfer your baguette to the linen dusted with flour, fold up the cloth on both sides of your baguette to make walls (this will help your loaf to keep its shape while proofing). Repeat the same with your other loaf. Lightly dust the tops with flour and cover them with a towel or plastic bag. Allow these to proof for 50-60 minutes at room temperature, you’ll know that they’re done when you gently press the dough with your finger and it slowly springs back, leaving a small indentation from your finger. Make sure you heat up your oven at least 30 minutes before baking (you can do this 20 minutes into proofing your dough). Preheat oven to 480ºF (250ºC) without fan/ventilation, have your baking tray/stone warming up inside, along with a pan of water on the bottom of the oven (this will create steam that will give your bread a nice crust), you want everything to heat up really well. Once your oven is ready and your baguettes have proofed, it’s finally time to bake. Have your blade ready to score the baguettes. Remove your hot tray/stone from the oven. Take your long piece of cardboard or thin cutting board and place it right by your baguette, take the folded part of cloth on the opposite side and flip the baguette onto the board lifting the cloth, (your baguette should be flipped seam-side up on the board), then flip this onto your baking tray/stone seam-side down. Repeat the same step of transferring with the other baguette. Then slash both of them with quick, diagonal movements (I make 3-4 cuts per baguette) these cuts shouldn’t be too deep, only 1/3 of an inch. Place your tray in the oven and bake for 30 minutes, rotating the pan halfway through baking. Your baguettes will be a dark golden color on the outside. If you notice that your baguettes are getting too brown, lower the temperature to 450ºF (230ºC) during the last 10-12 minutes of baking. Once you remove your baguettes from the oven, immediately remove them from the tray and place on a cooling rack (this will prevent them from getting a soggy bottom).The bread will seem extremely hard in the first 10-15 minutes, but as it cools the crust will soften. Cool your baguettes for at least 30 minutes before eating. Store in a bread box or bag for up to 2 days at room temperature, stale bread can be toasted, made into croutons or breadcrumbs.